Yesterday, I got sent down a rabbit hole of discovering how podium relates to accurate kelvin temps better especially since there isn't a direct way to set colors via Kelvin temp numbers. To keep it simpler to you guys, I'm going to short cut things a bit. It started with source image from google that shows how the temperature changes color as it goes from 1000-10000k (labeled with Source in the zip). I replicated the model in sketchup and ran a bunch of renders in Podium. the QMC is the main graphic here. All files used will be in an attached zip file including a render and model of only white lights. The light itself is based on a podium browser light but modified to be more similar to the source image. This is the sight link below that I made a windows powershell script to convert kelvin to RBG but isn't 100% accurate as noted by the author himself. I know powershell so I converted it to ps1 for people here. It should be enough for most use. script in zip. keep it handy as a just in case. don't read the comments unless you want to to be up until 3am. but even better as in more accurate...is this reference table. I used 10deg kelvin to RBG numbers for the model. Don't ask why just note it's more accurate. note the white portion is around 6600K. All my colored renderings use this table and I never change the colors or illumination in any render. I -do- slightly change the wall texture to more replicate the source and I slightly change the reflectivity of the wall texture in different renders so it's not a complete apple to apples comparison but it's pretty close. I should have just left it default white but I'm not re-rendering. here is a variation of the same list but the white point is around 5700k and which is more attributed to lcd monitor whites. It's irrelevant for our purposes but showing anyway. We only care about RBG numbers. the research base link of the site that posted those tables. Ignore if you enjoy next 2 hrs of your life. - it's interesting to note that the wires of the lights almost never resolve clearly in any render. They should be made bigger along with the base. 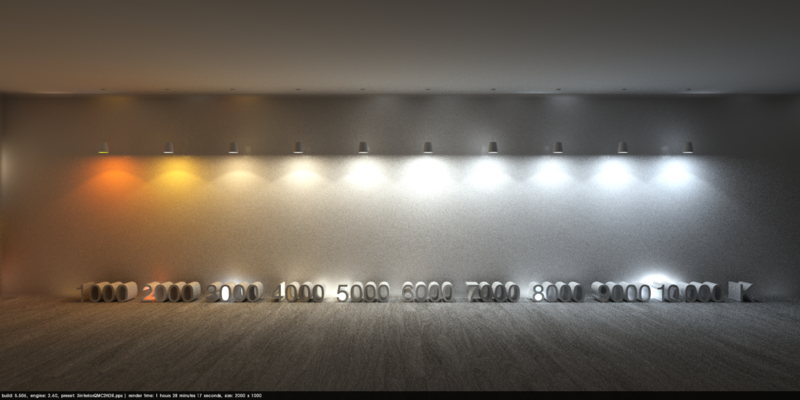 - even on the all white lamp renders (and in every render made), the different lights had different intensity and were never consistent about it even though all are components of each other. The intensity changes from render to render even on the QMC setting. - Random balls of light appeared in every render even on the QMC render which I thought only happened on biased rendering and I believe qmc is not-biased but accurate ray tracing. - soft omni lights where checked for all renders. - I couldn't replicate the source wall unless I probably did it via small polygons to show depth but that would have been taking it too far. - the 10,000k blue wasn't as blue as the source render but this is probably ok. It's just something to note. -It's interesting to note that as a standard kelvin color like you see it in the chart still doesn't reflect the light as it renders out as a light. The chart color doesn't show how the light becomes a gradient as it falls off and away from the source. - the textures I used are to the right in the model. 1 of the cube has multiple wood textures to save space. the wood floor ended up not being a podium wood. - the image with all white lights has a black light case that was changed to white after that render and for all remaining renders. - all major presets where used and attached so you get an idea of output and time to render. - the high preset seemed brighter than all other renders. it's also possible and probably that the hdr preset is affecting the light colors. I havent done any non hdr renders yet. Nice detailed explanation! thanks a lot jlo checking the zip right now, also liked the link on one the pages "what color is the sun" saved the page for the RGB K colors also, great info! the file ps1 how do I use it? ps1 is Windows Powershell. you will have it natively on all versions of windows since win7 and you can add it to xp and vista if you are still running those. Older OSs may have older versions of ps1 but that should not be an issue here- no new commands in the script. 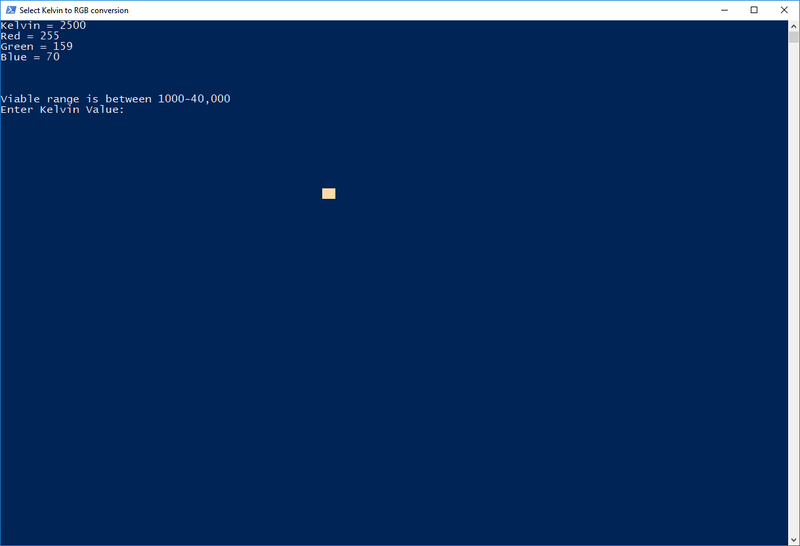 Powershell is the new dos or commandline if you're familiar. - Integrated Scripting Environment which has a gui added on top and is a simple editor (something like notepad on top and ps1 window on bottom with a help field on the right). This may be the simpler one to start with for the newby. 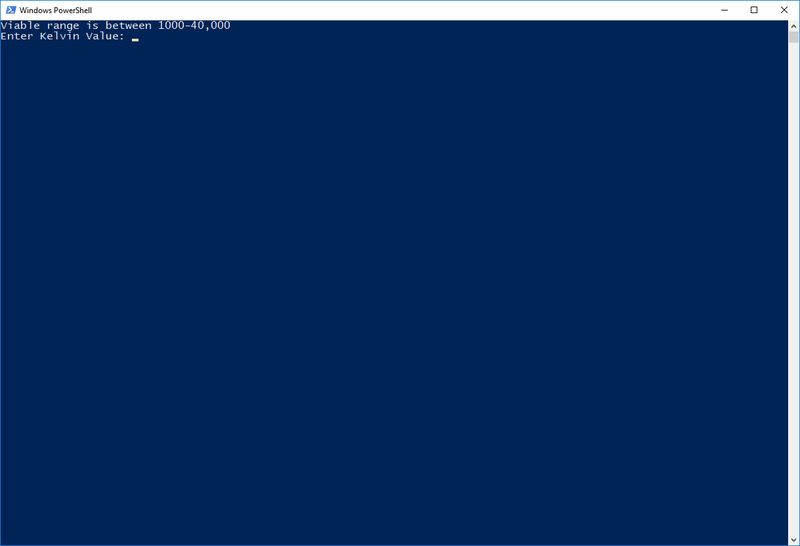 type "powershell ise" into the run field. Using ISE in this tutorial (either can run the script). follow steps below. You will likely have to do the 2nd bullet first but only once. open the script I have provided (file - open - choose script) and you should see the script at the top. My name is in the first line (commented out). Hit F5 or the run button at the top to run the script. Follow directions in the blue portion (enter kelvin temp then hit enter button). read results. Use them. profit. if ps1 doesn't allow you to run (external) scripts yet (security feature). You will only ever have to do this one (the first) time. Do this: close and re-open ISE with admin privileges-- When typing in powershell ISE in the run field -RIGHT click the icon or name (not left) then choose "run as admin" - you may have to "yes" in a middle message box- then it should open normally. In the blue portion Type or copy/paste "Set-ExecutionPolicy" then type the policy. Mine is currently "RemoteSigned" (if this doesn't work for running the script - try "Unrestricted"-- how I typically set my machines as an IT guy). "Restricted" is the default and why you have to do this process first. You should be able to run the script normally after changing this setting forever on forward. Go back to bullet 1. -complain if this doesn't work. Here are the non-HDR preset renders. I don't really notice any difference in output. very cool by the way! give me a sec, I'll tell you how to fix. Read-Host "Press any key to close..."
save this and run it again. I'll make a more elegant solution though. Very Cool! Thanks a lot John! John this all looks awesome! A lot of work so thanks for sharing out to the community - i'll be reading over in greater detail tonight. This is some great information! We could potentially use it in a future version of Podium to set colour based on lamp type or colour temperature. Each lamp type, whether it is LED, halogen, fluorescent, incandescent or high pressure sodium has a different colour temperature. Use the chart before you use my script for more accurate numbers. If you want to integrate something into podium itself, I can probably update the script to be more accurate and then someone could probably build it in to podium itself or convert it to ruby (I don't know ruby). Lighting is a field onto itself and a huge part of architecture that often doesn't get much credit for it's significance. Well, we are working on the next major version at the moment. There is a long way to go and there are lots of basic things to implement first. When we start to look at lighting, I'll discuss this with the team. It would need me to design a new UI with the workflow implemented and all the values of all the controls connected to render parameters. We do want to make some modifications to lighting, and to be honest it could do with a major overhaul. Until I understand what the differences and improvements are in the new version of the render engine, I can't really make any meaningful comments right now. It may be that significant lighting improvements come with V3.1 or something like that, but for now it's impossible to say. that is music to my ears bigstick!